Modifications Disulfide bonds between Cys7-Cys28, Cys13-Cys33 and Cys17-Cys35. Amino acid Alanine at position 20 was replaced by Cysteine (Bold in the sequence). Label ATTO-594. Maximum absorption 601 nm; Maximum fluorescence 627 nm. The fluorescence is excited most efficiently in the 580 - 615 nm range. This label belongs to the class of Rhodamine dyes and can be used with fluorescent equipment typically optimized to detect Texas Red and Alexa-594. Activity Tityustoxin-Kα blocks cloned KV1.2 with high potency1,2. 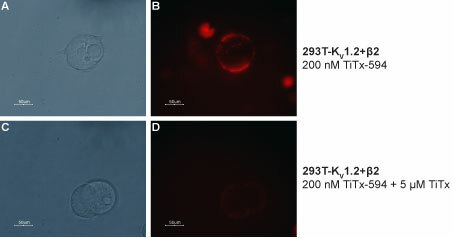 Using Alomone labs Tityustoxin-Kα-ATTO-594 in microscopy technique, Williams R.W. et al. showed recently that stimulating adenylate cyclase (AC) decreased surface KV1.2 within the pinceaus of cerebellar basket cell (BC) axon terminals3. Rogowski, R.S. et al. (1994) Proc. Natl. Acad. Sci. U.S.A. 91, 1475. Werkman, T.R. et al. (1993) Mol. Pharmacol. 44, 430. Williams, M.R. et al. (2012) J. Neurosci. 32, 9228. Shipping and storage Shipped at room temperature. Product as supplied can be stored intact at room temperature for several weeks. For longer periods, it should be stored at -20°C. Avoid exposure to light. Solubility Any aqueous buffer. Centrifuge all product preparations before use (10000 x g 5 min). Avoid exposure to light. The product is lyophilized in 0.5 ml conical vial. Storage of solutions Up to two weeks at 4°C or three months at -20°C. Avoid exposure to light. Tityustoxin-Kα-ATTO-594 labels KV1.2 channel in mouse cerebellum. A. Staining of free-floating mouse brain sections using Tityustoxin-Kα-ATTO-594 (#STT-360-AR) (red). Sections were then stained using Anti-KV1.2 (KCNA2) Antibody (#APC-010) (1:200) followed by goat anti-rabbit-AlexaFluor-488 (green). Tityustoxin-Kα-ATTO-594 and KV1.2 are both detected in the pinceau structures (yellow staining, arrow) of the cerebellum. B. Same brain sections as in A were labeled with Tityustoxin-Kα-ATTO-594 (red) followed by anti-Parvalbumin. Tityustoxin-Kα-ATTO-594 (red) labeled the pinceau structures (arrow) of the cerebellum. Parvalbumin stained not only the pinceau but also the soma of Purkinje cells. Co-localization between the two is depicted in yellow. Alomone Labs Tityustoxin-Kα-ATTO-594 binds KV1.2 including β2 transfected HEK293T cells and is displaced by unlabeled Tityustoxin-Kα. HEK293T cells transfected with KV1.2 and β2 were incubated with 200 nM Tityustoxin-Kα-ATTO-594 (#STT-360-AR) in the absence (A,B) and presence (C,D) of 5 µM Tityustoxin-Kα (#STT-360). Similar results were observed by using 100 nM Tityustoxin-Kα-ATTO-594 (data not shown). Alomone Labs Tityustoxin-Kα-ATTO-594 inhibits rKV1.2 heterologously expressed in Xenopus oocytes. A. Time course of KV1.2 channel currents at 60 mV before (black) and during (green) application of 100 nM Tityustoxin-Kα-ATTO-594 (#STT-360-AR) for 1 min (indicated as bar). Currents were elicited by application of voltage ramp from a holding potential of -80 mV to +60 mV in 100 ms. B. Example of superimposed current traces before (black) and during (green) 100 nM application of Tityustoxin-Kα-ATTO-594. Tityustoxin Kα (#STT-360) is a potent and specific blocker of KV1.2 channels1,2. It was originally isolated from the scorpion Tityus serrulatus venom2. The labeled version of the toxin, Tityustoxin-Kα-ATTO-594, has been tested in electrophysiology applications and is specially suited to experiments requiring simultaneous labeling of different markers. Tityustoxin-Kα-ATTO-594 (#STT-360-AR) is a highly pure, synthetic, and biologically active conjugated peptide toxin. Alomone Labs Tityustoxin-Kα-ATTO-594 labels surface Kv1.2 channels in the cerebellar pinceaus of rat cerebellar slices. 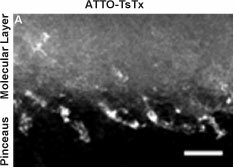 Overnight incubation of fixed rat cerebellar slices in 3 nM Tityustoxin Kα-ATTO-594 (#STT-360-AR) gives positive signal in the molecular layer and in the pinceaus of BC axon terminals. Scale bar, 10 µm. Adapted from Figure 4 in Williams, M.R. et al.